While you’re doing good for your body at the Mackay Marina Run, why not do good for others at the same time by supporting this year’s event beneficiary, the Leukaemia Foundation. By fundraising you help give local families facing blood cancer the emotional and practical support they need, along with supporting the Leukaemia Foundation to invest in vital research into better treatments and cure. Follow the easy steps to set up your own personal fundraising page. The highest individual fundraiser and highest team fundraiser are awarded trophies – so start fundraising and see how far you can go! 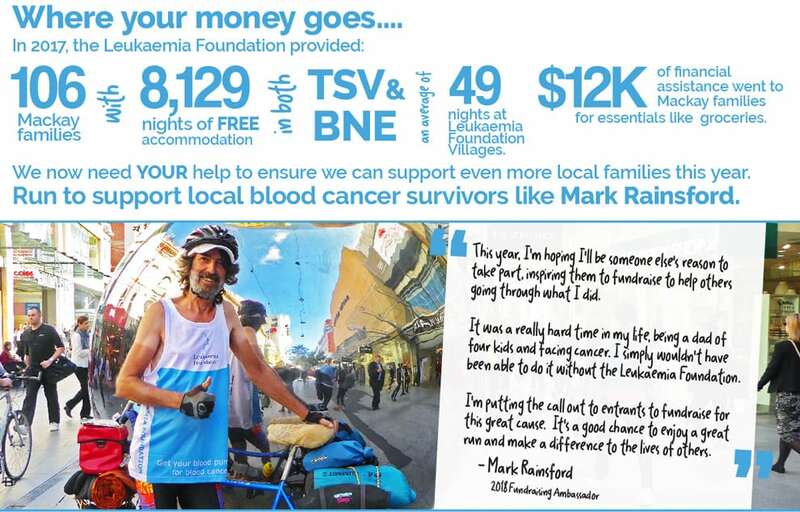 The Leukaemia Foundation provides each year, on average, 55 Mackay families with 4,132 nights of free accommodation both in Townsville and in Brisbane. Each family is supported for an average of 60 nights at one of the Leukaemia Foundation Villages. Thanks for fundraising events like the Mackay Marina Run, in 2018 the Leukaemia Foundation provided $24,437.21 of financial assistance to Mackay families, helping to pay for essentials like groceries and transfers to Brisbane for vital treatment. We now need YOUR help to ensure we can support even more local families this year. Set up your fundraising page. Lindsay, Liam, Kris and Alexis Cotton at Liam’s bell ringing, Mackay Base Hospital, Feb 2018.